What story is that, you ask? Why the news about the unveiling of the new "conjugal coat of arms" for the Duke and Duchess of Cambridge, of course. But since you've already seen one or more stories about it, why am I bringing it up here? Because I have a complaint about it. 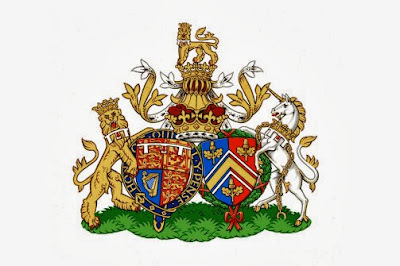 In brief, my complaint is this: That is not a "new conjugal coat of arms"! It is not even "a" coat of arms. It is two coats of arms (neither one which can truly be considered to be brand "new") arranged in an heraldic display that can be called a marital achievement of arms, complete with helm, crest, coronet of rank, supporters, compartment, and some other external additaments (such as William's Garter). The key word in that sentence being "external," that is, not a part of the "coats of arms." A coat of arms is the shield and its colors and charges. An achievement of arms has all that other stuff. When you combine two separate and distinct coats of arms into a display of a marital achievement of arms, you get the kind of picture that all these news stories have been talking about, but you do not get a "conjugal coat of arms." Have I made myself clear?